OVG says the unspecified money sought would be under the guise of the garage being a “regional transportation solution’’ to ease congestion in the surrounding area. Both KeyArena groups are seeking public funding to offset costs of building without first securing teams. The Oak View Group’s plan to build an 850-stall parking garage adjacent to KeyArena was largely viewed as a beneficial component of its $564 million all-private renovation proposal. Which agency is OVG talking about? The Port of Seattle. OVG spokesman Lance Lopes said Sunday the unspecified “Port contribution” would be sought as a “regional transportation solution’’ to ease congestion in the surrounding area. The plan is one example of how both KeyArena groups are seeking varying degrees of public funding to offset the massive costs of building their projects without first securing teams. Seattle Partners — a combination of Anschutz Entertainment Group and Hudson Pacific Properties — already has generated controversy by proposing a $521 million renovation that uses $250 million in public-bond funds. But the SP plan also projects a yearly surplus amount for the city it estimates would total $144 million over a 35-year lease term. The plan would see the city service the bonds via an annual $5 million lease payment from SP as well as a “facility fee” of $5 per ticket. The city also would be guaranteed a share of incremental ticket, parking and beverage and occupancy taxes. SP would guarantee the city a predetermined yearly revenue stream to service the bonds. Once the annual bond debt is paid, the SP plan projects a leftover surplus of $1.35 million in Year 1, $1.53 million in Year 2, $1.7 million in Year 3 and so on for the city, totaling $144 million after 35 years. In turn, Seattle Partners estimates saving $47.8 million off the lower interest rates public bonds entail compared with private loans. The city isn’t without risk, as its bonding capacity for future projects would be lowered and it still could be on the hook for repaying the bonds if SP becomes insolvent. Oak View Group’s proposal of a $564 million overhaul would use $414 million of private equity — mostly from its Madison Square Garden Co. minority shareholder — and an additional $150 million via a Goldman Sachs loan. But though OVG is privately funding the construction, it seeks a share of city admissions, retail sales, excise and parking taxes afterward. It would guarantee the city an amount equal to what the arena currently generates, then split additional tax revenues once that threshold is surpassed. Chris Hansen has pledged to privately fund a new arena in the Sodo District but also would seek certain tax concessions after construction. 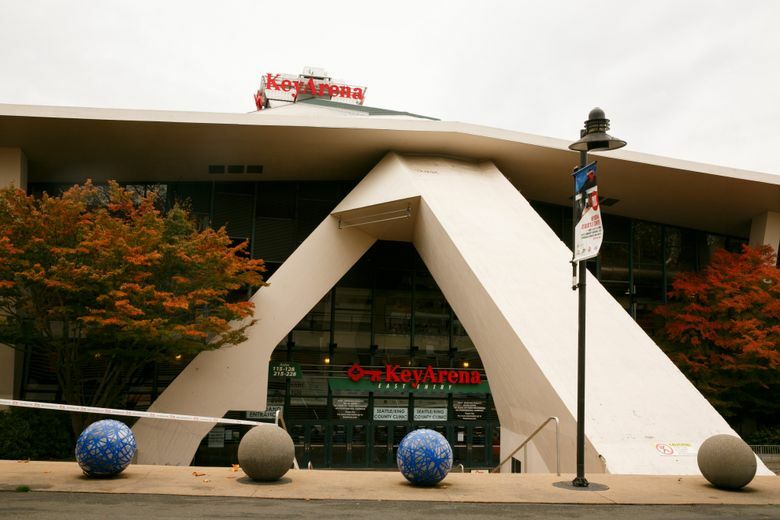 Unlike Hansen’s proposal — contingent upon getting NBA and NHL teams — the KeyArena groups would be taking a bigger financial risk by building immediately. Then there’s sponsorship at Seattle Center beyond the arena redevelopment site. The SP proposal includes paying the city an annual fee “for the exclusive right to sell sponsorship rights as they relate to the Seattle Center campus’’ beyond the arena. The fee would equate to what the city averaged in sponsorship sales from 2014-2016; SP would keep revenue beyond that. SP spokesman Aaron Pickus said Sunday the deal wouldn’t impact existing sponsorship arrangements already in place. OVG seeks to sell and split sponsorship proceeds with all for-profit ventures on the Seattle Center campus — including the Monorail, Space Needle, MoPOP and Chihuly Garden and Glass. The group says it would not interfere with the city’s selling of sponsorships at the rest of Seattle Center outside the arena location.